IS TODAY'S SORRAIA POPULATION SUFFICIENTLY LARGE? How many Sorraias still exist? Has the situation improved? The situation has improved to a degree as far as numbers are concerned, but there is a grey zone because many are sold without the new owners being recorded. There are probably still not many more than around 200 head the world over, but it is difficult to keep count of them. 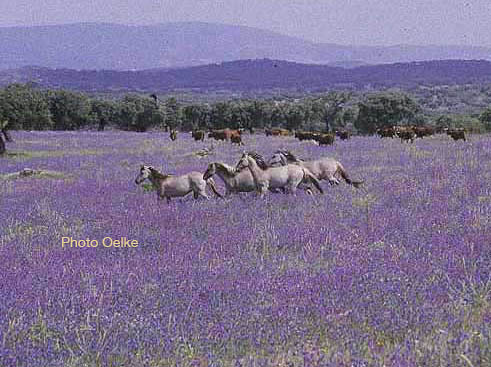 Over the last years, quite many foals were born in Portugal and outside of it, but there are always some that are sold and of which one cannot keep track. The total number of possibly 200 head includes foals and youngsters as well as other non-reproducing horses. The total count of reproducing mares is probably less than 100, which is of course alarmingly few, and nowhere near what would ensure the survival of the Sorraia, the most primitive Iberian horse we have today! If one considers the extreme inbreeding these horses had to suffer, their survival is more than just at risk.